The 17th annual Florida Cup, a celebration of the Sunshine State's rich heritage of Thoroughbred breeding and racing excellence, was held under sunny skies, with temperatures in the low 80's at Tampa Bay Downs. All the action took place on a fast main track and a firm turf course in front of a spirited crowd of 5,227. Total all-sources wagering was $6,853,237, a 6.7-percent increase from last year's Florida Cup Day. As he watched the Touch Vodka Turf Classic through his binoculars from beneath the awning in the winner's circle, trainer Mark Casse offered advice to jockey Tyler Gaffalione, even though the rider was too far away to hear. Their 4-year-old gelding March to the Arch did the rest, moving smartly to the lead on the turn for home and drawing off to a three-and-a-quarter length victory from defending race champion Swagger Jagger. Big Changes finished third. March to the Arch completed the mile-and-an-eighth distance in an excellent time of 1:47.66. It was the fourth victory in 11 starts for the son of Arch-Daveron, by Black Sam Bellamy, who is owned by his breeder, Charlotte Weber's Live Oak Plantation. The victory was also the seventh for Live Oak in Florida Cup competition. The winner's share of $60,000 raised March to the Arch's career earnings to $259,314. “He broke alertly and put himself in good position, right behind the speed,” said the 24-year-old Gaffalione, a 2013 graduate of Sunlake High School in nearby Land O' Lakes. “I was following the favorite (Big Changes), and when it looked like he wasn't really going anywhere, I just tipped him out and he finished the job. For Casse, who was winning his fifth Florida Cup race, it brought back memories of Live Oak homebred World Approval's victory in the same race two years ago. World Approval used it as a springboard to a season in which he won the Breeders' Cup Mile and earned an Eclipse Award as Champion Turf Male. March to the Arch paid $6.40 as the second wagering choice. The heart-stopping victory by Global Access in the DRF Bets Sophomore Turf was all in the family for Global Access and his breeder-owner, Charlotte Weber's Live Oak Plantation juggernaut. Global Access, who rallied on the outside to defeat Swamp Rat by a head in near-stakes-record time of 1:41.35 for the mile-and-a-sixteenth, is a half-brother to March to the Arch, who won the Touch Vodka Turf Classic earlier on the card. Global Access, who finished third in the Columbia Stakes here on March 9, is by Giant's Causeway out of Daveron, by Black Sam Bellamy. Still, jockey Antonio Gallardo had to work hard to get past Swamp Rat and third-place finisher Jais's Solitude before the wire. But it took an all-out drive to pass Swamp Rat late and take the top prize, rewarding his dam with her second stakes victory on the card. Global Access improved to 2-for-6, with two thirds, both in stakes races. The $60,000 winner's share of the purse elevated his career earnings to $103,668. It was the eighth Florida Cup victory for Live Oak Plantation. Swamp Rat nearly held on under jockey Daniel Centeno, and the Philip Gleaves-trained youngster should be one to watch next time. Global Access paid $9 to win as the fourth betting choice in an eight-horse field. 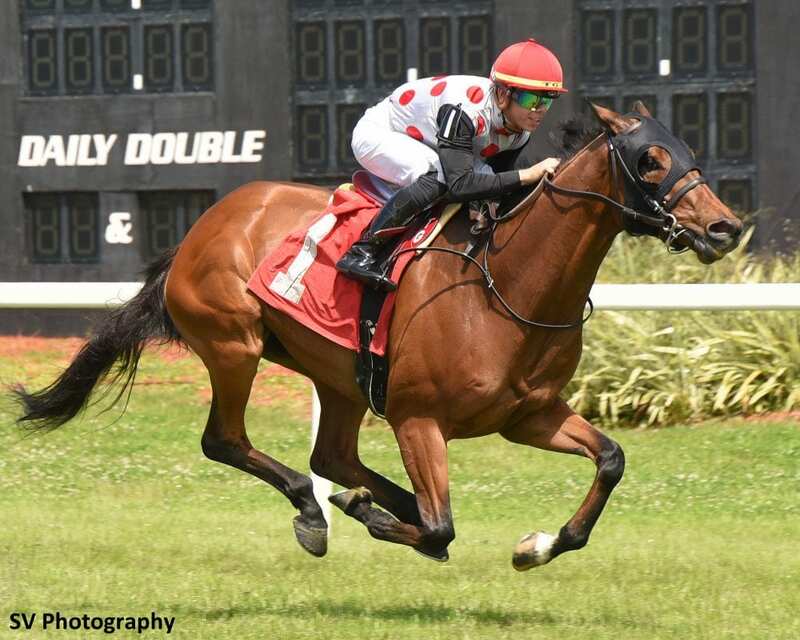 Trainer Jose Pinchin's instructions to Tampa Bay Downs leading jockey Samy Camacho were direct and to the point before Jackson's impressive victory in the Ocala Breeders' Sales Sophomore. Jackson held up his end of the bargain, winning in a good time of 1:23.05 for the 7-furlong distance. Great Success held on well to be second, followed by Gran Paraiso. Jackson, a 3-year-old son of Kantharos-Deposit Only, by Put It Back, was bred by Pinchin's wife Tracy Pinchin, who also owns the colt. He improved to 3-for-8 with his second career stakes victory to go with three seconds, all in stakes races. The winner's share of $75,000 raised his career bankroll to $218,475. “I told (Camacho) if he broke good, to take (the lead),” Jose Pinchin said. “I know he'll get 7 furlongs. He won a stakes at Gulfstream Park (West) going six-and-a-half against better horses than these. “He's a nice horse who can run on turf or dirt, so we have a lot of options with him,” Pinchin added. Jackson paid $6.40 to win. The Pinchins own an unraced 2-year-old full sister to Jackson, so perhaps they'll be back with her for the 2020 Florida Cup. James Bredin, the Racing Manager for the DARRS, Inc., enterprise of owner David Ross, probably summed things up best after Extravagant Kid outdueled pace-setter Ray'swarrior to win the Zaxby's Sprint by a head in 1:09.77 for the 6-furlong distance. Extravagant Kid needed all that fortitude to turn back Ray'swarrior, whose Jason Servis-trained stablemate, Grade I winner Firenze Fire, finished third in his comeback race after finishing fourth last fall in the Breeders' Cup Dirt Mile. The winner, who improved to 9-for-32 lifetime, four of his victories in stakes, is a 6-year-old gelded son of Kiss the Kid-Pretty Extravagant, by With Distinction. He was bred by Vicino Racing Stable. Extravagant Kid is trained by Brendan Walsh, who was in transit from the United Arab Emirates after winning Saturday's UAE Derby with Plus Que Parfait. Ross claimed Extravagant Kid last January for $75,000. Tyler Gaffalione rode Extravagant Kid for his second stakes victory on the card. Extravagant Kid appeared a winner inside the 1/8-mile pole, then Ray'swarrior battled back to take a brief lead under Samy Camacho. But Extravagant Kid had a bit more left and pulled away. “They wanted to duel it out to the wire. My horse has a lot of heart, and he showed it today,” said Gaffalione, who also had three seconds in the series of Florida Cup races. As the field reached the turn in the Stonehedge Farm South Sophomore Fillies, Wildwood's Beauty appeared to be dropping back. But that was all part of the plan, according to jockey Chris Landeros. The daughter of Kantharos-Miss Propitious, by J P's Gusto, won for the second time in five starts, with three seconds. Bred by Philip Matthews and Karen Matthews, she is owned by William Stiritz and trained by veteran Scott Becker, who won the 2009 Hawthorne Derby with Proceed Bee. Eyeinthesky was always prominent, but no match for the winner through the stretch. Here Comes Jackie, owned and trained by Mike Dini, finished third. The winner's share of $75,000 raised Wildwood's Beauty's earnings to $134,340. This entry was posted in Racing and tagged antonio gallardo, Arch, bruce hill, Charlotte Weber, florida cup, global access, Horse Racing, live oak plantation, march to the arch, Mark Casse, michael trombetta, tampa, tampa bay downs by Press Release. Bookmark the permalink.